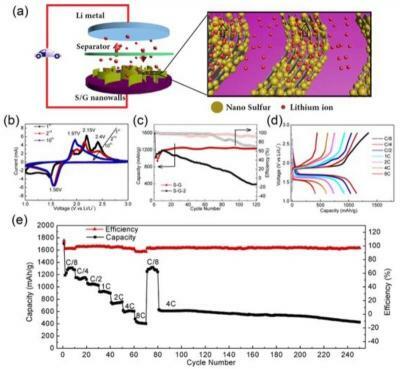 Researchers at Beihang University in China developed new cathode materials for lithium-sulfur batteries, made from vertically aligned sulfur–graphene (S-G) nanowalls on electrically conductive substrates. These new cathodes are reported to allow fast diffusion of lithium ions and electrons and achieve an excellent capacity (of 1261 mAh g–1 in the first cycle, and over 1210 mAh g–1 after 120 cycles) and high-rate performance (more than 400 mAh g–1 at 8C, 13.36 A g–1). The scientists claim that these impressive figures position it as the best demonstrated rate performance for sulfur-graphene cathodes.